You’d think that after seven full lessons on the workings of a “simple” image cataloging and editing application such as iPhoto we would have thoroughly exhausted the subject. But no, I have just a little more to talk about before I can wrap up this soon-to-be-tidy package. We’ve talked about iPhoto’s smart albums—albums that iPhoto can generate based on the conditions you create, such as pictures taken with a flash during 2012. You can make your smart albums even more powerful by “tagging” your images with ratings and keywords. Slap a five-star rating on your favorite images, and it becomes a cinch to gather them into a single smart album. Assign the keyword “jojo” to any pictures that include that ill-favored cousin, and you never need view the guy’s smarmy mug again. Doing each is easy to accomplish. The ratings game: iPhoto allows you to assign a rating from zero to five stars. You can invoke such a rating in a few ways. The first is to choose Photos > My Rating and then choose the rating you like. Or you can Control-click (right-click) an image and, in the menu that appears, click the appropriate star rating (see the screenshot above). But the easiest method of all is to select one or more images and press the appropriate keyboard shortcut: the Command key plus any number from 0 to 5. Even with the keyboard shortcut, this task can be tedious when you’re confronting a library that holds thousands of images. You can deal with such a backlog at your leisure. In the meantime, get into the habit of rating new images right after you’ve imported them. Creating and assigning keywords: Keywords are another way of tagging and finding images. For example, you might add the keyword “beach” to pictures you’ve taken by the seashore. 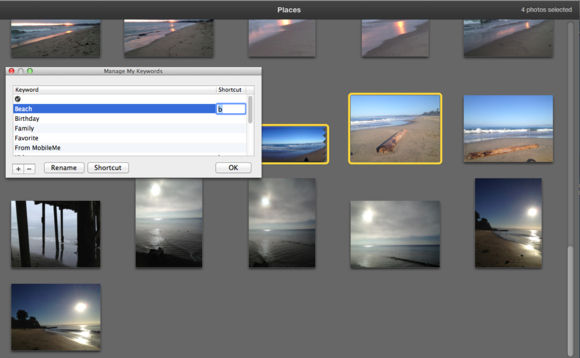 To assign a keyword just select one or more images and click the Info button at the bottom of the iPhoto window. In the pane that appears, click in the Keywords field and type in your keyword. That word will be associated with all the selected images. You can now easily find these images by typing the appropriate keyword into iPhoto’s Search field. Once you’ve created a keyword, you can associate it with images more easily. To do so, choose Window > Manage My Keywords (Command-K). In the resulting window, click the Edit Keywords button, and in the list of keywords that appears select a keyword—beach, for example. Double-click in the area under the Shortcut heading, type a keyboard shortcut for the keyword—in this example, I’ll use the letter b—and click OK. The keyword will appear in the Quick Group area of the Keywords window. You can easily assign keywords to selected images by typing a shortcut. Now—with the Keywords window still open—select some of your beach images and press the B key on your keyboard. The “beach” keyword will be assigned to the selected images. In the course of these iPhoto lessons, I’ve written about sharing images via Photo Stream and sharing pictures through social networking services, email, messages, and prints. But there’s one more way: sharing images over your local network. Launch iPhoto on each Mac operating on the same wireless or wired network. On one of these Macs, choose iPhoto > Preferences and click the Sharing tab. The resulting window will show a few options. Enable the Look for shared photos option, and any other Macs on the network that are currently sharing their iPhoto libraries will appear under the Shared heading in iPhoto’s Library pane. To allow the Mac you’re sitting in front of to share its library, enable the Share my photos option and then enable either Share entire library (which does exactly that) or Share selected albums (and then choose the albums you want to share). You can additionally enter a name for your shared library, as well as require that other people who wish to access your library enter a password to do so. To view shared images, just select any entry that appears under the Shared heading in iPhoto’s Library pane. (If you see a lock next to a shared library, you’ll have to enter the library’s password to access it.) Do that, and the library’s images will appear in the main part of the iPhoto window. Tip: Something many people fail to realize is that when you connect to a public network—such as a Wi-Fi network in a coffee shop or a hotel’s network—with a copy of iPhoto running on your computer, other Mac users connected to that network can see your shared images if you’ve enabled password-free sharing in your copy of iPhoto. For this reason, it’s often wise to require a password. As with any creative undertaking, if you practice something often enough your skills tend to improve. Such is the case with photo editing. Last year’s oversaturation and extreme contrast adjustments may have seemed artful at the time, but now that you’ve learned some of the nuances of image editing, those edited pictures may horrify you. Thankfully those edits aren’t permanent. Just select the now-offending image and choose Photos > Revert to Original. When you do a dialog box will warn you that pursuing this course of action will cause all the edits you’ve applied to be removed. Click the Revert button to forge ahead. If you’re not entirely sure about your decision, choose Photos > Duplicate (Command-D) to make a copy of the edited image. With a backup of that image (complete with all the edits you’ve applied), you can then select the original and revert it to its imported state. And that’s iPhoto from soup to nuts. If you’re coming to this series late, you can catch up with the previous lessons. Next week: Our iMovie explorations begin.